4000 pre sale tickets are all gone! The Black Circuit Paddock Party is the culmination of Johnnie Walker’s 2 month-long Black Circuit campaign for the F1 as they help take Team McLaren Mercedes to the top! It’s triple trouble on the decks of Aloha with DJ Shortee Blitz (MOS UK), who’s played alongside De La Soul, Cypress Hill and Run-DMC, among others; DJ Tang (MOS S’pore), a master turntablist and DMC ilumni; and DJ E-Turn, deemed the #1 DJ in Taiwan who drops vinyl for Wu Bai and China Blue. These 3 deck superstars get all freak nasty on your booteh with enough hip hop groove to rev you up proper. 8pm-3am. RM30 inc. 1 drink. For info, log onto www.blackcircuit.com.my. Be the 1st 1000 to register at the Black Circuit official website and receive free passes! 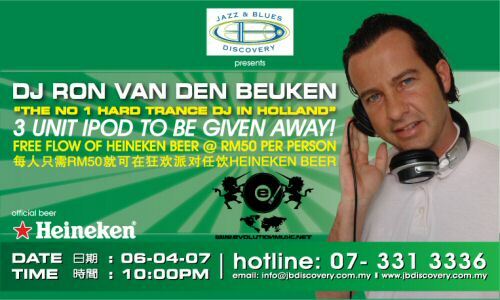 Ron van den Beuken is one of todays most influential trance music producers and DJs in Europe. He is best known for his chart topping global smash singles like “Timeless”, “Endless”, “Find a way”, “Mary goes wild”. He produced for Netherlands biggest music label Spinnin Records and makes remixes for artists such as Ferry Corsten, Sander van Dooren, Randy Katana, Fragma, 4 Strings or Tatana and many others. Ron has sold thousands of records through his numerous releases in the last 5 years. He has also received extensive music videos and radio airplay across the world and was awarded by the prestigious dutch awards as best producer 2005. His extensive touring schedule has taken him across the world as a DJ. He has performed in countries including the UK, Mexico, Colombia, Dubai, Germany, Canada, Poland, Russia, Netherlands, Switzerland, USA, China and many more. He is spinning as headliner at big Festivals like Mayday, Goliath, E-Lake, Alpha Festival, Nature One etc.